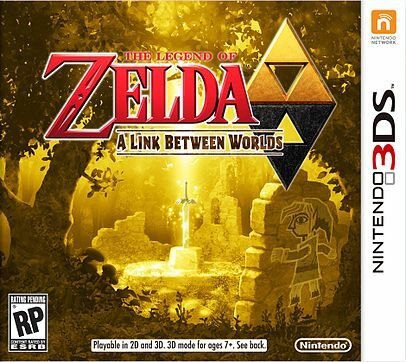 I realize I’m reviewing a new game from a franchise that has a 25+ year history, so before reading my thoughts on The Legend of Zelda: A Link Between Worlds, it may be helpful to refer here, here and here for my comprehensive Zelda background. I remember reporting on the Nintendo Direct where Reggie announced that a sequel to A Link to the Past was in development, and I remember everyone’s reaction to the game’s debut trailer. Some were elated and bounced around the room like small children, regardless of their age. And some were extremely apprehensive, thinking there’s no way Nintendo could ever capture that lightning twice. These are the same people who wrote detailed blog posts or Facebook statuses that talked about various trailer analysis videos. The worlds are too similar. There aren’t enough differences in the dungeons, either! The paper mechanic is a gimmick at best! I realize that anyone who reacted positively probably already has the game, or they really want it and won’t be swayed by anything I say. My words are attempting to reach those who are either on the fence in general, or those who are skeptics and see the handful of poor reviews that stick out like a sore thumb among the game’s positive fanfare. 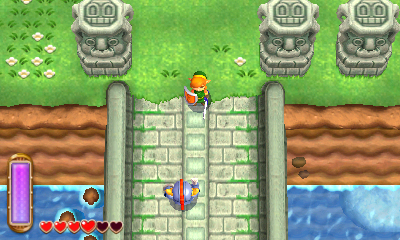 Is A Link Between Worlds overhyped? 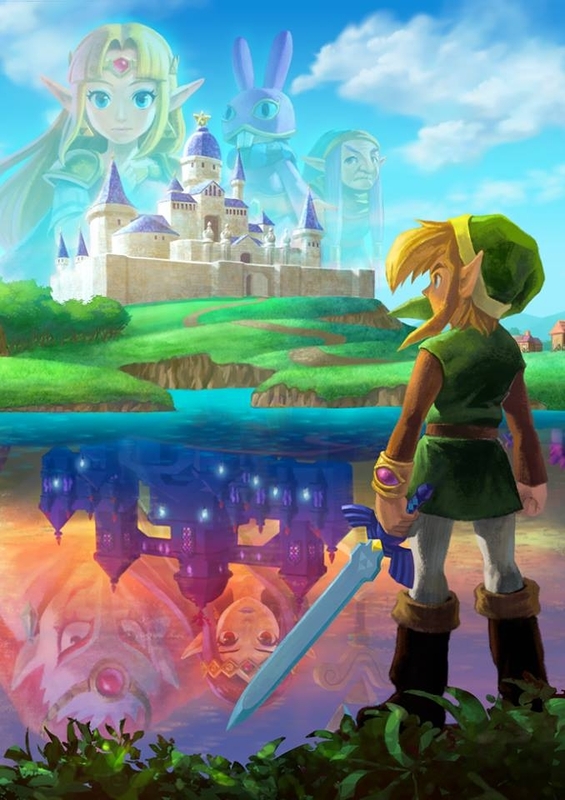 It may not be practical to begin my review by discussing some of the game’s weak points, but stay with me: Those of you looking for a truly immersive story along the same lines of Twilight Princess, Skyward Sword, Majora’s Mask or other argued favorites in the franchise may be disappointed by what A Link Between Worlds presents you with by the end. 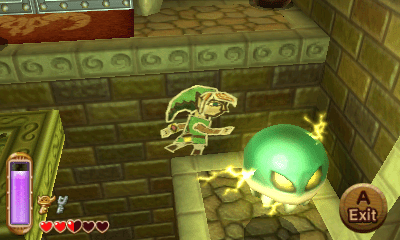 This isn’t to say that the story is bad or flawed in any way–this is just to say that the Link to the Past sequel handles itself exactly like its predecessor did. It focuses heavily upon world-building over plot. Link’s journey is not a struggle filled with philosophy, inner-conflict, and emotion–it’s a journey filled with friends to get to know (and to save) in ways that follow A Link to the Past almost to the letter sometimes. There’s nothing wrong with that; story is just not the game’s strongest attribute. 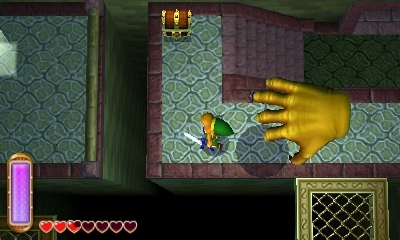 Other small, rather nit-picky negatives I feel the need to express: saving is done by talking to Bird Statues (a lot like Skyward Sword), which is…not really best-suited for hand-held games or quick-play bursts. While other first-party Nintendo games handle saving particularly well, this one may frustrate you from time to time. Also: the item upgrading that can happen in the game doesn’t seem to serve a higher purpose (e.g. enhancing exploration…all it seems to do is make various items a little more handy; it’s not necessary or rewarding in any way, really), which makes one of the many premises touting replay value fall just a smidge short of its mark. 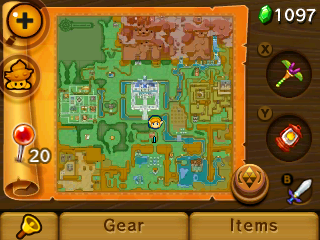 Assuming you look past its (arguably minor) flaws, though… A Link Between Worlds is so amazing, I want to scream. Anyone who insists Nintendo couldn’t capture the same essence as A Link to the Past, in my opinion, couldn’t be more wrong. Heck, anyone who’s never played the Super Nintendo classic will still feel very welcome in this game’s world. The game’s soundtrack borrows heavily from its predecessor (as it should, in my opinion), but improves it so drastically that it pushes the 3DS to its limits, sometimes even surpassing the lofty orchestrations present in other strong system-selling soundtracks like Kid Icarus: Uprising or Fire Emblem: Awakening. When you hear this music, it won’t just bring about nostalgia (assuming you’re a fan of A Link to the Past); it’ll make you respect the 3DS as a system just a little more than you did before. A lot of people could take or leave the game’s graphics, but I consider them to the game’s credit. They’re a natural evolution of A Link to the Past, they breathe new life into spaces both familiar and brand new. I would even go so far to say that I want to see this kind of artistic style in the Zelda on Wii U (assuming they decide to go against the tech demo shown at E3 in favor of a more cartoon/colorful style like The Wind Waker or Skyward Sword). Even if you’re adverse to them at first, I think these are the kinds of graphics that’ll grow on you as you become more familiar with the game. A lot of you who’ve stuck with me this long want to hear more about gameplay. There’s a reason I saved it for last. It’s because A Link Between Worlds does something Zelda hasn’t managed to do since the very beginning of the franchise. Nintendo wasn’t joking or putting on money hats when they insisted exploration is up to you–it really, really is. 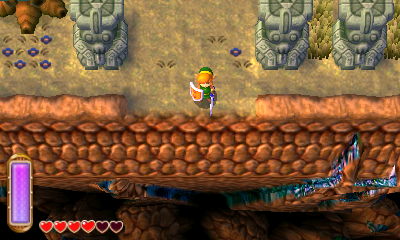 The ability to have Link merge with the walls of the world comes to you just after the game’s first dungeon, and as soon as that happens–the world is your oyster. After sufficiently exploring every nook and cranny of the world with my newfound paper-abilities, I had enough rupees to rent every item in the game. And before I even did that, I grabbed a power glove and some flippers from some of the people I met while exploring. 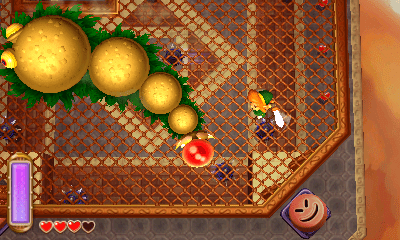 You can obtain almost every item in the entire game before even beating a second dungeon. You’re tasked with conquering three dungeons before something happens, then seven more. What order you complete these dungeons in is entirely up to you. Most of the time, how you choose to complete the dungeons is up to you, too. The game has some degree of sign-posting insofar as if certain weapons are required to advance, you’ll know to pick them up from Ravio. Two of the seven dungeons in Lorule reward you with items necessary to enter other dungeons there, but very rarely does the game restrict you in any way. 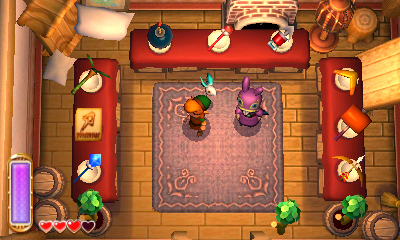 Ravio’s prices aren’t unreasonable, nor are his rental conditions. You have items until you die. Fantastic–I never died, because fairies and smart use of potions. By the way–monsters drop various items in addition to hearts. Horns, claws, tails… I thought they would all be used to upgrade items like in Skyward Sword, but instead they’re used to brew potions. Kind of disappointing, but at least drops are plentiful enough that you’ll always have the potions you need whenever you want them. That isn’t to say combat wasn’t challenging. A lot of these enemies were genuinely fun to fight, and bosses posed a decent challenge. Sometimes I didn’t know what the hell I was doing and thanked the goddesses for fairies–other times, I was praying to beat a boss within two minutes before I had to stop playing and I did so. There’s a good mix of bosses that make you say, “Holy crap!” to bosses that make you amend that explanation with “…what a pushover!” Also: the battles done via StreetPass are no joke, and I absolutely got “pwned” by a few Shadow Links I faced while ill-prepared. This is, perhaps, the most non-linear Zelda to ever exist since the very first Legend of Zelda. I hope my preceding words have proven I’m not hyperbolic or exaggerating in any way. 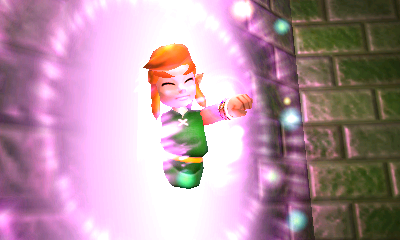 When it comes to A Link Between Worlds being praised for its sense of exploration, believe the hype. Solving puzzles comes fairly natural, too. Since very few of them offer items necessary to advance (Ravio takes care of most of that), dungeon exploration and level design rely heavily upon player intuition and use of items you already have. Finding some of the materials necessary to enhance your sword (this is an upgrade system entirely separate from regular item enhancing, which I mentioned earlier) may require some extra brain-power, but…these level designs were very intuitive. Everything about the game (from pieces of heart to the hundred creatures scattered around the world to collect in order to enhance items) came quite naturally to me. I’m not bragging when I say this, but A Link Between Worlds is the first Zelda I’ve ever been able to 100% without some sort of strategy guide. I’m not sure if I would consider the ease of finding things and solving puzzles a credit or a detriment, but I think that mostly depends on your play style, not mine. But this game has a lot of things. Replay value is absolutely assured. Will completing dungeons in certain orders truly affect the game’s plot? What if someone wanted to complete the game using only one item at a time? Could it be done? These are questions devoted Zelda fans will seek to answer, questions that will turn A Link Between Worlds from a good Zelda game to a timeless classic. 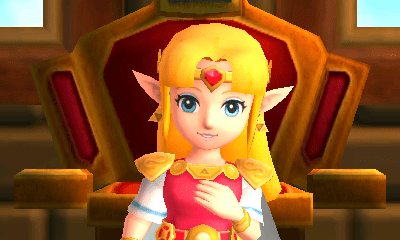 Hopefully I’ve managed to dispel concepts that have many people waving on A Link Between Worlds. This game doesn’t accomplish anything revolutionary in terms of its presentation, but it does offer an extremely refreshing take on Zelda gameplay. If Iwata’s notion of A Link Between Worlds being used as a testing ground for concepts that will only continue to evolve in Zelda on Wii U is true, I couldn’t possibly be more hyped. Whether or not you consider this game to be the best the franchise has produced in decades is determined by how you play Zelda and why. Assuming you’re willing to look past its story in favor of non-linearity, I can promise two things: this game is a worthy follow-up to one of the most celebrated games in the entire franchise, and you will find something new to love about Zelda as a whole throughout your journey. If the journey is a Zelda game’s biggest reward, the freedom granted to the player in A Link Between Worlds makes this experience truly worth celebrating.